So. Newton, MA to San Antonio, TX = roughly 2050 miles. About 3 days of travel, if you time it properly and don’t stop much along the way. Jason and Morrigan left in the Penske on Friday afternoon, pushed hard, and got into San Antonio late on Sunday night. The other two boys, plus our cat, left about an hour after the Penske, and arrived in San Antonio on Monday morning. All but the last two hours of travel happened on Friday, Saturday, and Sunday, so those are the days that I’m going to focus on in this two-part series. Because Friday was the Really Crazy Day, this post will be All About Friday – the Day of Multiple Curses. Sound ominous? Yeah. I didn’t sleep enough, of course, so Jason took an Uber to the Penske pickup while I gulped down coffee and started last minute packing/cleaning preparations. Curses started early. Penske had already lost our reservation a few days before this, and apparently, it was lost again by the time Jason arrived to pick up the truck. Sigh. Many phone calls and much finagling followed, and eventually, we were given a truck. This truck turned out to be 1) not actually registered to us and 2) a total piece of crap. 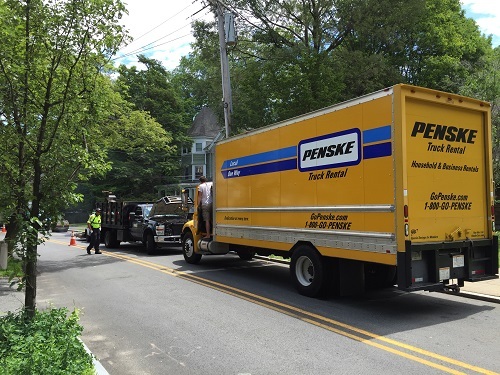 After trying and failing to get into our driveway, we parked the Penske on the street and began to load. 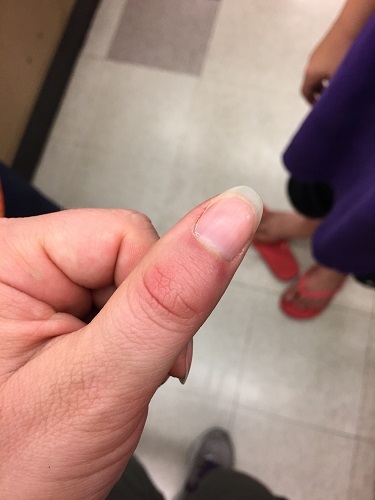 It was at this point that I managed to smash my thumb between a trunk and a 10-lb weight. Yowch. Otherwise, packing went smoothly. We had the truck all done by noon, and the plan was to go get food and then leave. After Jason and Morrigan left, the other two boys and I got lunch, packed the van, shuffled the poor cat into his cage, and prepared to leave. At this point, Laurence became distraught. He does not like saying goodbye to things, and we experienced the same last year when we left our house in San Antonio. I let him go around the empty house and take pictures of everything before we left, and let him cry it all out as we drove out of town. He said goodbye to everything – familiar restaurants, schools, grocery stores, etc – bawling the whole time. As soon as we were out of our normal area, he felt better, and was happy and cheerful for the rest of the trip. I’d like to say the rest of Friday when smoothly, but if you’ll recall, it was the Day of Curses, and so it did not. Even though it was only 1:30 in the afternoon, we ran into traffic almost immediately. It lasted a couple hours. Jason warning-texted us about traffic in Connecticut, and we ran into it on the other side of Hartford. Standstill traffic for hours, while Laurence began to feel lightheaded and dizzy, and no place to turn off. (Thankfully, a mini-nap revived him.) The cat was mewing like crazy, hating all the stop-start movement, really freaked out in a way he wasn’t when we made the trip last year. The traffic didn’t stop until we crossed into New York. Thankfully, I didn’t get lost in NYC this time. Yay! And we didn’t run into more traffic after that. My original intentions were to reach Bethlehem, PA on the first day…but I’d expected to not get on the road until 5-ish. Since we got off at 1:30, I expected to get a lot further. Traffic, however, turned the normally 4.5-hr drive from Newton to Bethlehem into an 8-hr drive. We made it just slightly further, into Allentown, before we stopped. To put that into perspective: When we made the trip north, we drove from halfway through Virginia all the way to Newton in about 9 hrs. We drove maybe 2/3rds of that distance – maybe – in 8.5 hrs this time. Sigh. In the evening, the fates took pity on us. I didn’t know which hotels were pet-friendly, and I saw a sign for Comfort Inn. I asked Siri if Comfort Inn allowed pets, and got back the miraculous reply, “Good news! You’re approaching a Comfort Inn in 1.8 miles and they seem to have a pet-friendly policy!” Thank you, Siri. Thank you, Apple. Thank you thank you thank you. And they did have a pet-friendly policy, and we got the very last room available. Yes. With relief, we settled in for the night. I’ll be back tomorrow to discuss the rest of the trip! Ye gods. I think the moral of this story is avoid Penske like the plague!! But you got a great story out of it! Funny enough, we really liked the Penske we rented last year. I think we just got a bad one this year because they lost our reservation. Grr.